When mature, the American alligator (Alligator mississippiensis) reigns at the top of his food chain. Only humans -- armed with weapons, not their bare hands -- can take on a grown gator. These fierce predators provide an important role in their habitat. Not only they do prevent overpopulation of certain prey species in their environment, but other animals take up residence in former alligator holes. While most often found in Florida and along the Gulf Coast, alligators live throughout the wetlands of the southeastern United States. Their range extends as far north as Virginia and westward to the border of Texas and Mexico. Alligators live in freshwater swamps, streams, lakes, bayous, marshes and rivers, although they can tolerate brief periods in saltwater. Alligators might spend short amounts of time in brackish water while en route to a new freshwater area. Only young alligators are in danger from other predators in their environment. Hatchlings might even by consumed by other alligators. Other species preying on juvenile gators include snakes, turtles, raccoons, osprey and otters. Larger fish also eat hatchlings. By the time an alligator reaches 4 feet in length, at about the age of 4 years, he's no longer in danger from non-human predation. Full growth and sexual maturity occurs when alligators reach approximately 6 feet in length, between the ages of 10 to 12 years. As carnivores, alligators basically eat anything in the realm of fish, amphibian, reptile, bird and mammal. Hatchlings devour snakes, fish, snails and amphibians. Hunting in the water at night, grown alligators consume most smaller prey whole. They pull large prey into the water and drown the victim, then eat it in pieces. These larger prey animals have usually come to the water to drink. The gator's mouth clamps down on their heads, pulling the victims into the water. 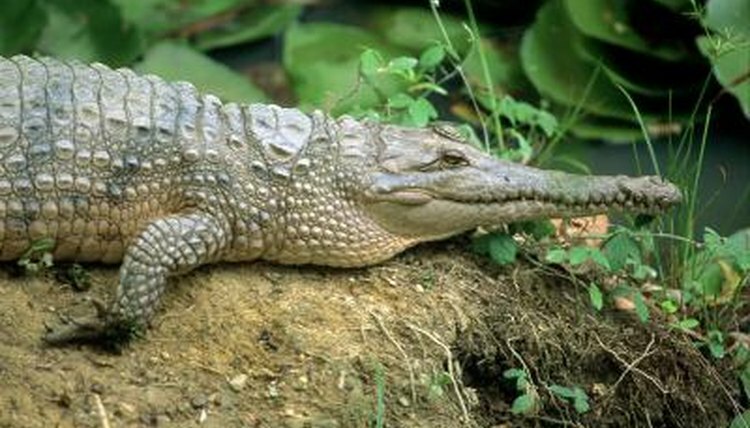 Mature male alligators dig holes in which to rest. Their powerful jaws, claws and tails eliminate vegetation and create these holes, which aid other species in various ways. Water fills these relatively deep holes, providing a source for drinking during dry seasons. The red-bellied turtle uses former alligator holes as a place to lay and incubate eggs. Wading birds, small mammals, amphibians, reptiles and fish also depend on the habitat created by the gator holes. As the Toronto Zoo website puts it, "Alligators provide conditions for supplying food and protection for everyone." Florida State University: Who Are Alligators?